Here at AllAboutBelgaum, we love our readers. We love our supporters and advertisers. And, we love our Facebook fans! We’re so excited that we broke the 1,000-fan threshold! And it is all because of you! Thanks, from the very bottom of our hearts. 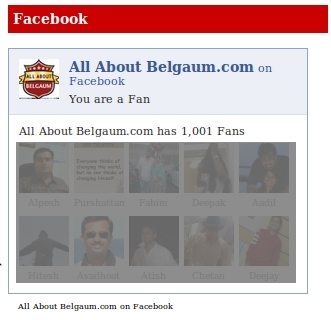 We created our Facebook page in late June 2009, and reaching 1000 fans for a local site we guess is not a bad number. There have been some updates only for FaceBook fans and the same will continue. cong8 very good site well done!!!!!!!!!! Congrats Uday!!! 🙂 We love ur blog! So hope u reach 5000 mark soon.